The Baba Sodal Mela began here today. Thousands of devotees thronged the Sodal temple to pay obeisance to Baba Sodal. The flip-flopping and doublespeak of the DEO (Secondary) office in the conduct of an inquiry into the mid-day meal status and records of a government school in the district have been delaying the possible expose of a potential fraud. The Municipal Corporation (MC) may submit its report with a recommendation of the dissolution of the Gaushala Management Committee looking after Pinjra Pole Gaushala on Tanda Road and another Gaushala at Bulandpur in Punjab and Haryana High Court on September 24. Disappointed by the occasional use of Guru Gobind Singh Stadium, the Jalandhar Improvement Trust (JIT) has now sent a proposal to the Punjab Government for the proper use of the mega structure, renovated at the cost of Rs 20 crore in 2011. The proposal has been approved at the local level and is now waiting for the final nod from the Punjab Government. The National Scheduled Castes Commission (NSCC) has taken a serious view of the Punjab Government's non-seriousness about the implementation of the various state schemes and plans, meant for the welfare of the state scheduled castes. The commission has decided to summon the state government on October 7 with a formal action taken report about the same. This was told by the commission's chairman Dr Panna Lal Punia to a delegation of the National Scheduled Castes Alliance (NSCA) president, Paramjit Singh Kainth, during a meeting held at Dr Punia's official residence in New Delhi. Raipur village in the district has missed a grant of about Rs 83 lakh for the village development works. The grant is being released by the state government through ‘NRI matching grant scheme’. Paramjit Singh Raipur (NRI), who is the president of the village Raipur (Phrala) Welfare Trust said, under the NRI matching grant scheme, any village can get up to Rs 1.25 crore from the state government with the condition that 25 per cent of the amount would be contributed by NRIs or villagers. Making it clear that they will not buckle under the pressure of Punjab State Power Corporation Limited (PSPCL), the protesting unemployed linemen demanding jobs in the corporation have announced to launch a massive agitation in the coming days. The press secretary of the Unemployed Linemen Union Sukhraj Singh stated that the PSPCL management had been making unnecessary excuses and was deliberately not handing over the appointment letters to around 4,000 unemployed linemen despite the instructions of the state government. It took nine months to complete the film ‘I Love You Soniye’, said the producer-duo and lead actors Karanvir Bohra and Teejay Sidhu here today. The star cast also includes Roadies-fame Raghu Ram, Comedy Nights-fame ‘Bua’ Upasna Singh and Vindu Dara Singh. The film will be released on October 24. To provide information about the crops to be sown for the Rabi season, a farmers’ training camp in Sultanpur Lodhi would be held on September 22. Giving this information, Chief Agriculture Officer Kapurthala Dr Manohar Singh said the camp would be inaugurated by former Punjab minister Upinderjit Kaur and Deputy Commissioner DS Mangat would preside over the camp. The entire locality around the temple was immersed in lighting amid playing of religious hymns on loudspeakers. Many individuals, social and religious organisations have put up stalls of free community kitchens for the devotees coming from far-off places and standing in long queues since mornings. “I have been coming to this temple from Sonipat for the last 10 years. Baba has fulfilled my wish and so I am here to thank him with my entire family,” said Rakesh Ahlawat, a devotee. Thousands of street vendors have made makeshift shops on all the roads leading to the temple. However, the arrangements made by the administration were found to be little adequate as various control rooms, like fire, police and medical, were made at different places with no clear route guidelines. Although, regular announcements were made for any loss or find of children and things, people coming from far-off places were finding it difficult to locate the various control rooms that were established away from the main route. The only respite was the presence of a fully equipped team of the Fire Department with an ultra-modern motorbike equipped with powerful gas capable of handling medium-level fire outbreak. 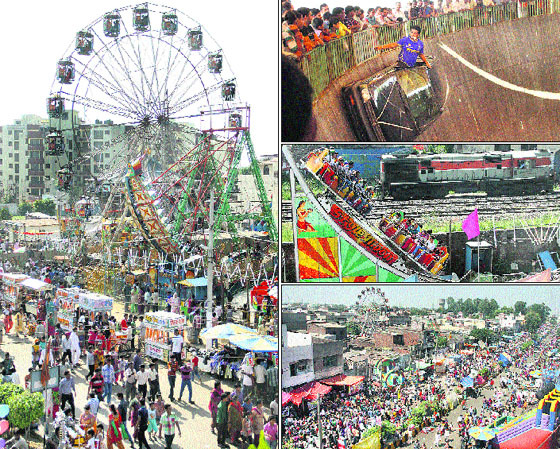 The mela will continue till Friday. The Baba Sodal Mela is held to commemorate the death anniversary of child deity Sodal. The fair is hosted on the day the child is said to have received his communion with God. Observed on the 14th of "Shukal Paksh" in the month of "Bhadon", which coincides with the month of September in the English calendar, the Baba Sodal Mela is one of the most popular festivals celebrated by the residents of the city. “This festival is celebrated on "Anant Chaudas" but the devotees come here two days in advance. People from all walks of life and religions come here with their families and take blessing from Baba Sodal,” said Surinder Chaddha, general secretary, Shri Siddh Baba Sodal Trust. Legend has it that Sodal, a member of the Chadha clan of the Khatri caste, sacrificed his life by drowning himself in the pond. Although prohibited by his mother, Baba Sodal then six-year-old followed his mother to the pond. Infuriated by his insolence, his mother asked him to drown himself into the pond. After asking his mother thrice and receiving the same answer, Sodal jumped into the pond only to reappear in the form of a snake. The people believed that the child was blessed with divine powers and celebrate his communion with God on this day. Following reports of an alleged fraud of over 30 quintal grain and cooking cost (worth over Rs 1.5 lakh) in the mid-day meal of Government Girls Senior Secondary School, Nakodar, by school Principal Raj Singh (the allegations were made based on findings of an RTI query filed by activist Kanwaljit Singh), the district Education Department had appointed two inquiry officers to look into the issue, both of whom were later removed before the inquiry could be completed. As per documents available with The Tribune, a day after the DEO (Secondary), Neelam Kumari, officially ordered the suspension of the inquiry into the alleged fraud, she misled the State Information Commission by stating that the inquiry was still going on. While in the last week of August, district mid-day meal manager Amarajit Singh was appointed as the inquiry officer, who he was later removed. While Amarajit Singh confirmed to The Tribune that he had been appointed, he refused to comment on the cause of his removal. In the first week of August, Paramjit Kaur, Principal, Government Senior Secondary School, Chak Kalan was appointed an inquiry officer by the DEO. On her first visit to the school on September 9, the school authorities refused to provide the required information to Paramjit Kaur. While she again went to the school and finished her inquiry on September 10, on the morning of September 11, she was given a letter by the DEO office, asking her to step down from the inquiry. She hadn’t even yet submitted the findings of the inquiry. Paramjit Kaur has also confirmed that she was prevented from doing her job in the inquiry. The MC supervisory committee, headed by Senior Deputy Mayor Kamaljit Singh Bhatia, prepared a report with the recommendation of dissolution of the Gaushala Management Committee allegedly due to non-cooperation of its office-bearers in improving the condition of cattle at the gaushalas. The committee will submit its report to Mayor Sunil Jyoti, which in turn may submit this report to the high court after taking legal advice. On the other hand, when contacted, the president of the management committee, Ravi Kakkar, said, "We are doing our level best with our resources to keep the cattle in good condition at both the gaushalas. The main reason for their bad condition is that both the gaushalas are overcrowded. We have written to the MC several times for providing more space for keeping cattle in better condition. It has not even given us even a single penny for the last one and a half year, whereas according to the agreement, it is supposed to pay us Rs I lakh per gaushala every month. Even then we are doing our best but overcrowding of the guashalas is creating hindrance. Despite all these adverse circumstances, we are doing our level best and adequate labourers have already been engaged for cleaning the gaushalas thrice a day." Earlier on August 30, the MC decided to take several steps, including starting kar sewa (voluntarily service) for improving the condition of cattle at the two gaushalas in the city following the directions of the Punjab and Haryana High Court. The management was asked to ensure the presence of two of its members at gaushalas for two hours in the morning and evening and for one hour in the afternoon to supervise the work of labourers. The management was asked to appoint a manager or a supervisor and keep at least 15 labourers at each of the gaushalas. "The main proposal is to restrict the use of stadium to only national and international sports events, besides organising state and district-level government functions. Giving the same for cultural shows in the past had severely damaged the expensive and ultra-modern sports infrastructure like water sprinklers, imported seats and other electrical equipment inside the stadium," said Mukul Soni, Superintendent Engineer, Jalandhar Improvement Trust. 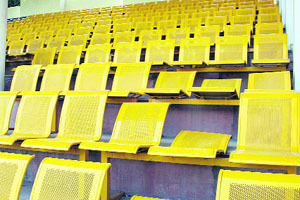 Recently, around 37 chairs in Pavilion 2 were damaged by spectators in a cultural event organised by a private company. The trust deducted the repair amount of Rs 1 lakh from the security deposit of the company. Also, the trust has proposed to charge a nominal monthly fee of Rs 100 from the daily walkers. Their use has also been restricted to the track area only. They will only gain entry into the stadium with the identity card issued to them after paying the monthly fee. Also, if the proposal gets a final nod from the government, only those players, authorised by the District Sports Officer or accredited sportspersons, would be allowed to practice inside the stadium. "For the effective functioning and maintenance of the stadium, we require money, the source of which has also been suggested in the proposal. We have suggested renting out the restaurant area in the Pavillion No 1 to a reputed food chain. Also, we have suggested to rent out the activity room to a reputed gym in the city. The selection will be done through tenders and a three-year contract will be signed with the successful companies," confirmed Soni. Also, the proposal has suggested meeting the shortage of security staff by taking ex-servicemen from Punjab State Ex-servicemen Corporation Limited (PESCO). The trust has taken the local approval for their monthly salary expenditure of Rs 1,30,000. The trust has also recommended hiring a housekeeping company for the cleaning and maintenance of the stadium. "We are hopeful to meet our maintenance expenses by conducting world-class sports events and renting out a few places inside the stadium. We are just waiting for the final nod from the government to start the bidding process," said Vinay Bublani, Chairman, Jalandhar Improvement Trust. In the absence of a well-defined centralised state policy for the upkeep of stadiums, the sports infrastructure in the state is in a very bad shape. 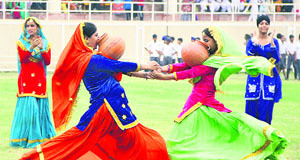 The Guru Gobind Singh Stadium was renovated at a cost of Rs 20 crore in 2011. Besides constructing two world-class pavilions, many ultra-modern sports infrastructures like floodlights, water-sprinkling system, activity room and VVIP lounge have been constructed inside the stadium. The stadium has been struggling for its sustenance since its renovation. There is no security staff to look after the safety of expensive world-class sports equipment installed inside the stadium. There are no generator to run the floodlights installed at a whopping cost of Rs 3.5 crore. Also, there is no specified path for the morning walkers inside the stadium. Children run and jump on the green area and have completely damaged the water-sprinkling system. The stadium, which was constructed to hold world-class football and kabaddi matches, has been mainly holding cultural events since its renovation. Giving information in this regard, Kainth told the mediapersons that Punia had assured the delegation of the NSCA that the commission was going to ask the state government, particularly the chief secretary to show some kind of seriousness about the state scheduled castes, having a population of over 35 per cent. He also said the government was playing with the sentiments of the weaker sections and deprived castes living in the state. Kainth revealed that during the meeting, Punia expressed his seriousness over the fact that the state government had failed to come forward on the earlier complaint made by the Chamar Mahan Sabha, in which it was raised that the state government had failed to spend Rs 4,039 crore sanctioned under various welfare schemes drafted for the upliftment of the state scheduled castes. "Besides, the state government also failed to even implement the sub-plan meant for the welfare of the state scheduled castes even as the state government had allocated the funds for the same in its budget for the year 2012-2013," he added. Kainth claimed that Punia had assured the delegation that if the state government failed to come forward with action taken report, than the commission will take stern action against the erring state officials. "But due to lack of awareness among village panchayats, many NRIs, despite of contributing lot of money for their village developments, are not getting the benefit of this scheme", stated Raipur, who is also the former sarpanch of the village. He also said today the work for the construction of the stadium in the village had been started. After a long protest agitation, in 2011, Punjab Chief Minister Parkash Singh Badal had ordered the PSPCL to recruit 5,000 linemen on contract basis. One thousand unemployed linemen were given the appointment letters but the rest were delayed following some legal issues. "The road for the corporation to give the appointment letters to the 4,000 unemployed linemen became clear after the state government got a go ahead from the Punjab and Haryana High Court in February this year," said Sukhraj Singh. The union leaders regretted that the matter was still pending. Compelled with the indifferent attitude of the state government and the PSPCL, one of the unemployed linemen Sarabjit Singh had allegedly committed suicide in Tarn Taran on July 12 this year. The incident was condemned by Punjab Pradesh Congress Committee president Partap Singh Bajwa blaming the SAD-BJP government for not addressing the problems of unemployed youth, who were protesting for long to get jobs. Sukhraj said, "It is ridiculous that so many delegations of the union have met the Punjab Chief Minister but to no avail. We met the PSPCL management but the response was not positive." He said when the state government was claiming that the PSPCL had registered a profit of Rs 300 crore, what was the problem in making the appointments as promised. "Till now, the union was pursuing the matter through talks but now the path of initiating a fresh agitation has come. On September 19, the union leaders and members would stage a protest demonstration at Chappar Mela in Ludhiana, where the Punjab CM would be present. We would not allow him to address the gathering at the mela," announced the union leaders. Besides debuting on the big screen, Karanvir and Teejay are also producing the film, under their newly-launched banner, Firebird Productions. For the first time in the Punjabi film industry, a real-life couple (Karanvir and Teejay) are coming on screen as 'reel couple'. Also debuting in Punjabi cinema, is Raghu Ram (Roadies fame). He plays Karanvir's elder brother. Also starring in the movie, are Vindu Dara Singh, Upasna Singh (the famous ‘Bua’ of ‘Comedy Nights with Kapil’ show), Shivendra Mahal and others. Joint Director Agriculture Department, Punjab Dr Nirankar Singh would address the farmers. Manohar Singh stated that during the camp, the farmers would be provided technical information about the sowing of crops. "The agriculture experts would make the farmers aware about the better variety of the seeds besides the proper use of the fertilisers and the pesticides," he added. Exhibition of the farm machinery would also be organised during the camp.